A favorite Russian comfort food is filled pies, which can be made either big or small and stuffed with a wide variety of fillings. Filled pies are definitely an all time favorite of Russians. Small, hand-held pies are called pirozhki; bigger pies are pirogi. In both cases, the dough and the filling are the same, but for pirogi, the dough is rolled out, put it into a baking dish, then filled and topped with smaller pieces of dough to form a second crust or lattice-work on top. 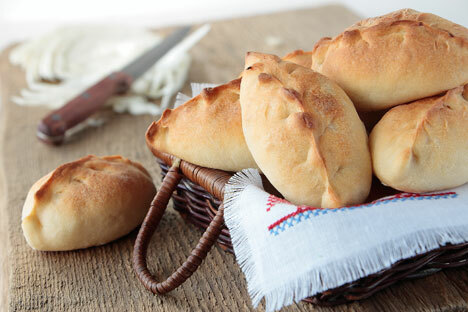 Although pirogi are always baked, pirozhki can be baked or fried. The ones commuters buy for a quick snack in the subway or from stands at train stations are usually fried. But to me, real pirozhki must be baked, like the ones my grandmother made. They were the culinary highlight of my childhood. My grandmother would make them for special occasions, like family birthdays, our annual New Years celebration, graduations and weddings. They were always another reason to get excited about an important day – sometimes the main reason. Pirozhki take a long time to prepare. The dough is yeast-based and needs time to rise, then the fillings must be made and then every pirozhok (the single form of pirozhki) must be formed so that the filling does not fall out. But this is what makes them so special. For a long time, the only thing my grandmother would tell me about making pirozhki was “that they take a long time.” When I started my own business, running a cooking school for foreigners in Moscow, I asked my grandmother to demystify them for me so I could write the recipe down. This was itself quite a challenge since my grandmother never measured anything! Now I’ve made pirozhki based on this recipe a number of times, and to me, they taste like a special celebration with my family. They are worth the effort, and are sure to delight your family and friends. 1. Heat the milk in a saucepan over low heat, stirring constantly until it reaches about 98 degrees Farenheit (36 celsius) up the milk. Add a little sugar to keep it from clotting. 2. Mix the flour with the salt and sugar, add the yeast, then the eggs and then the milk. 5. Divide the dough into small pieces the size of a tennis ball. Flatten each piece of dough until it is palm-sized. Put in some filling and close the dough. 6. Put the pirozhki on a baking tray, beat another egg and brush it on the pirozhki. Let them rise about 10 min. Bake at 390 Farenheit (200 Celsius) for 20-25 minutes. 7. Take the baking tray out of the oven and put the pirozhki on wooden board to cool. 2. Boil a small pot of water with salt. Put the chopped cabbage into the pot , turn heat off and leave for 5-10 min. 3. Boil the eggs until they are hard boiled. 4. Drain cabbage until dry and mix with mashed boiled eggs, add butter. Boil eggs, finely chop spring onion, mix with feta cheese (or butter). If feta is too salty, drain in water to get rid of excess salt. Fry onions with ground meat in melted butter. If too dry, add some broth. Slice the apples into thin slices. Mix with cinnamon, butter and sugar.